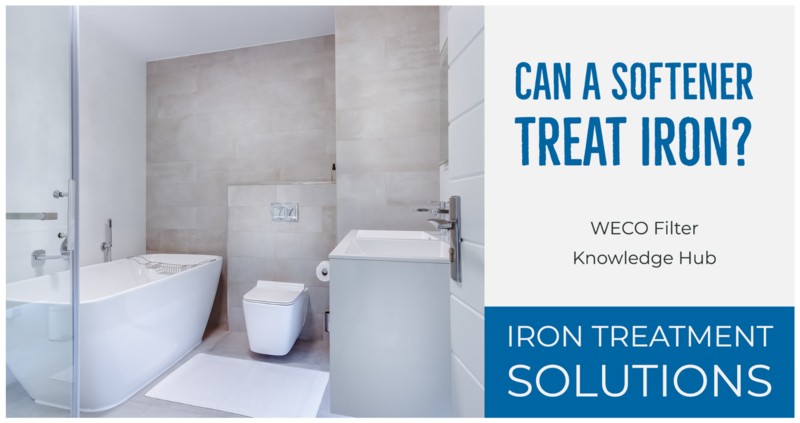 Can a Water Softener Treat Iron? Our experts can help you determine the correct system, so please consult us before ordering. The limiting factors in choosing the proper filtration media include the amount of dissolved oxygen, pH level, oxidation-reduction potential (ORP), water temperature, and carbon dioxide (CO2). 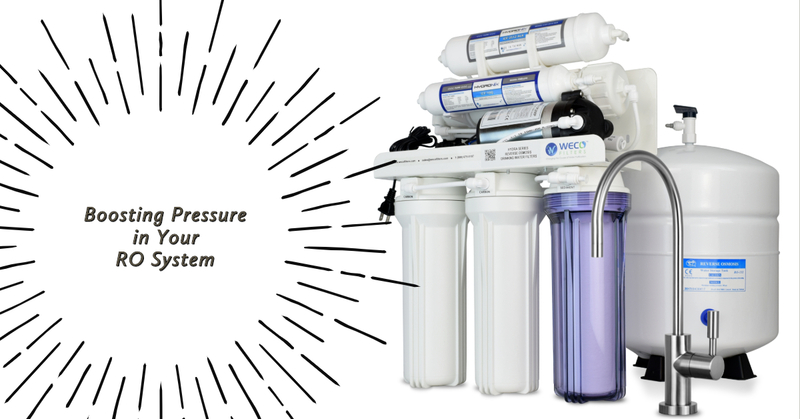 Let WECO help you find the proper system to best meet your needs. How much iron is too much in my water? Water sample analysis should always report the combination of all forms of iron present in the sample. A high concentration of all forms of iron lead to an unacceptable characteristic in water that makes it unsuitable for drinking, washing dishes, bathing, and laundry. High levels of iron in your water – a total iron concentration of 0.3 PPM or higher -- can stain kitchen and bathroom fixtures, dishes, cookware, laundry, and masonry surfaces. Domestic uses of water allow iron concentrations of 0.1 parts per million (ppm) or milligrams per liter (mg/L); however, several industrial applications call for a total absence of iron concentration in water that is used for process work. So, can a water softener alone treat iron? Theoretically, if the water has sufficient levels of calcium and magnesium ions, yes; however, iron reduction through softening is an old and largely inefficient technique that involves using and wasting salt that finds its way into groundwater. This is one reason why softeners are increasingly being banned from use. According to guidelines from the Water Quality Association, a water softener can remove iron from water with a minimum pH of 6.7 (unaerated water) with an efficiency of 0.5 PPM of iron (Fe) for every grain per gallon (GPG) of hardness, up to 10 ppm. However, our WECO experts recommend that you do not use softeners for iron reduction. The salt generated from softening makes its way into groundwater supplies, which becomes difficult for municipalities to treat in the wastewater. By increasing efficiencies to reasonable levels and not using extremely wasteful designs, such as using a softener for iron reduction, we can reduce our reliance on water softeners and help wastewater treatment a more manageable process. The principle of ion exchange can be used to treat water containing high levels of dissolved iron (water clear when drawn) without softeners. According to the ion exchange principle, calcium and magnesium ions can be exchanged for dissolved iron. A co-current regenerating cation exchange water softener can be utilized to treat dissolved iron concentrations of 1 ppm or lower. Treatment of dissolved iron concentrations of above 1 ppm should involve oxidizing technologies to maintain softener efficiency. 1. Eliminate any contact with air. 2. Regenerate the ion exchange softener vigorously and often before the actual softening capacity of the softener is exhausted. Like many elements, iron can exist in a few chemical forms. Fe(II) and Fe(III) are two common states for iron: Fe(II), or water-soluble ferrous iron, and Fe(III), or ferric iron, which is insoluble in sea water. As their name implies, iron bacteria are microorganisms that have developed specialized machinery to thrive off of ferric iron. Iron bacteria are microorganisms that use the oxidation of ferrous iron to ferric iron to “fix” dissolved carbon dioxide into organic molecules that they use to stay alive. Iron bacteria can thrive even at very low concentrations of dissolved iron. Iron bacteria, which belong to genuses such as Crenothrix, Leptothrix, and Gallionella, only need a continuous supply of Fe(III) and oxygen to metabolize ferric iron into their cell structures, and to deposit gelatinous ferric hydroxide iron compounds. Iron bacteria growth results in the formation of a gelatinous sludge that can cause pipe encrustation and produce foul-tasting drinking water. Telltale signs of iron bacteria include the presence of a jelly-like mass and a surface that reflects an iridescent (rainbow) slick. Iron bacteria is one of the most difficult forms of iron to remove and control. Colloidal iron can be visually detected in a water sample, as can ferric iron and organic ally-bound iron. However, unlike the others, colloidal iron stays in suspension, lending a red-pink, turbid hue to the water sample. Colloidal iron is very highly dispersed and has a very low specific gravity almost equal to that of water. The suspended particles of iron appear to be floating, and sometimes are bound to silica. The colloidal particles can have a slight negative charge. It may take a water sample containing colloidal iron 48 hours for the iron to begin accumulating at the bottom of the container. In municipal or industrial water treatment plants, colloidal iron is treated with the addition of aluminum sulfate (alum) or another coagulant. The iron binds to the coagulant and partially precipitates out; it can be removed from the water through a granular medium filter system. How can excess iron be removed from my water? Many years ago, Birm was a go-to media for iron removal. Katalox Light (KL) are other media used for iron removal. Every media has its pros and cons. KL media has a slightly higher backwash rate requirement than Birm, and tends to elevate the pH significantly on occasion. But, KL can handle far higher iron, manganese and H2S levels than Birm. Birm is highly restrictive in its application and oxidant use. Please note that, like every other manganese dioxide ore based media, both KL and Birm have very definite limitations. Dissolved oxygen, pH, ORP, water temperature, carbon dioxide, and other factors all have to be taken into consideration in the iron removal process. Even then, it can be hit or miss. KDF-85 filtration media is rated to treat iron and H2S (concentrations up to 5 ppm), but it is not a good choice, especially for treating higher levels of iron. KDF is rated for a higher effective flow rate than KL. However, KDF-85 is also considerably more expensive and the backwash rates simply make it a poor choice for residential iron reduction. A final method for iron removal is air injection. The air injection method is a simple and reliable method of removing iron. Air is simply drawn in to the water every time the pump cycles. This air enters a tank which keeps a large air pocket that the water cascades through to further oxygenate the water. Excess air is purged out of the top of the tank. If air alone is not sufficient, a simple hydrogen peroxide injection system can be added later, if needed. However, most of the time, air is adequate. 1. “Iron Water.” Water Quality Association, Knowledge Base Administration, www.wqa.org. 2. “Water Softener Forum, Questions and Answers.” Terry Love Plumbing & Remodel DIY & Professional Forum, terrylove.com. 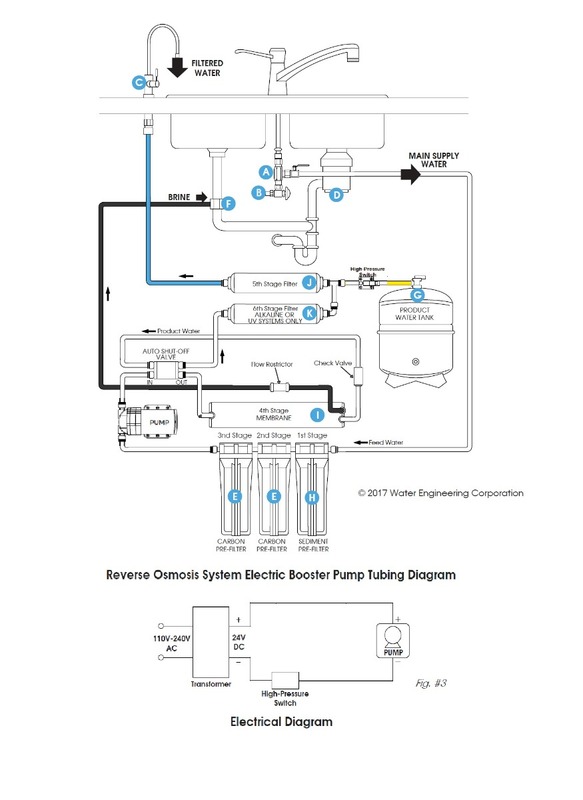 How do I boost pressure in a reverse osmosis system? What is the perfect water pressure for my RO? Most revers osmosis membranes are designed to work with 60 PSI or higher water pressure, where they are tested to yield a stable rejection rate of at least 97.5%. If the water pressure feeding an RO system is less than that, the system will produce less water and at a lower quality. Additionally, production is reduced whenever the water temperature is below 77 °F. Private well systems most commonly have pressurized storage tank and pump systems with 20/40 psi or 30/50 psi on/off pressure settings. In such cases an electric pressure boosting pump must be installed to provide adequate rejection of specific health-related contaminants in the feedwater, such as nitrate or arsenic and others specified by the US EPA or local regulations. What if I connect my ice maker? RO water will produce cleaner ice cubes because of the purity of frozen water. So, connecting your RO to the ice maker makes a lot of sense. However, new ice makers require 30-40 PSI incoming water pressure to function properly. You may not have enough pressure at the pressurized water tank since your RO cuts the line pressure by 30-35%. How can I increase water pressure? We will discuss several ways to boost the pressure coming out from your cold-water line to run the RO. Permeate pumps use the energy of drain water flow from reverse osmosis system as leverage to push the purified water into the holding tank. Aquatec, the manufacturer of ERP-1000 permeate pump states that these pumps dramatically improve the efficiency of reverse osmosis water (RO) production, reducing wastewater by up to 80%. 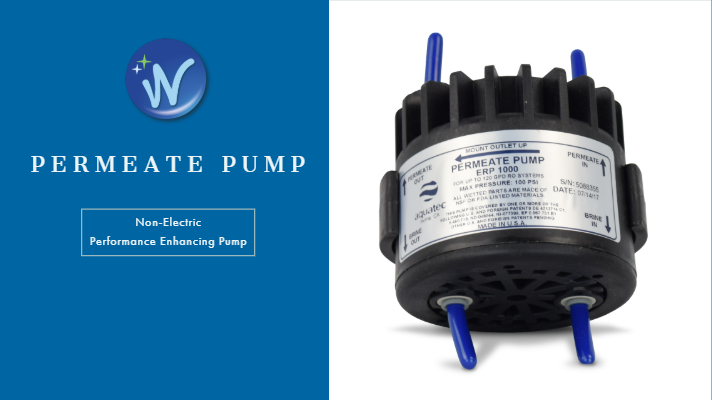 Permeate pumps can easily be retrofitted to upgrade existing RO systems. 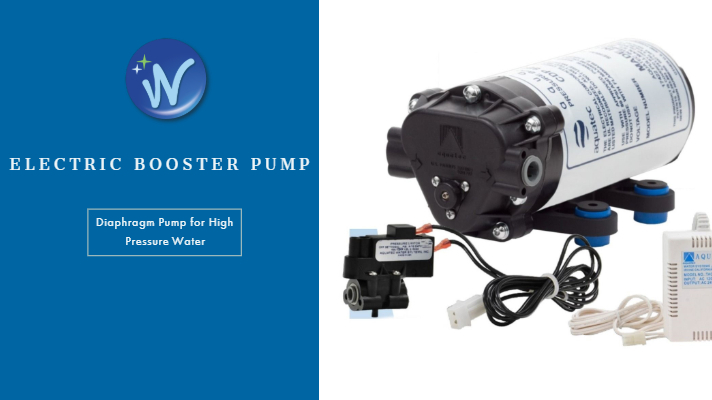 Adding an electric booster pump increases the RO production rate, boosts the pressure tank storage volume, rejects more contaminants and increases faucet flow rate even if the reverse osmosis membrane pressure rating is met by the water supply. Residnetial RO systems work with diaphragm booster pumps that will typically increase the feed pressure upto 75-100 PSI. 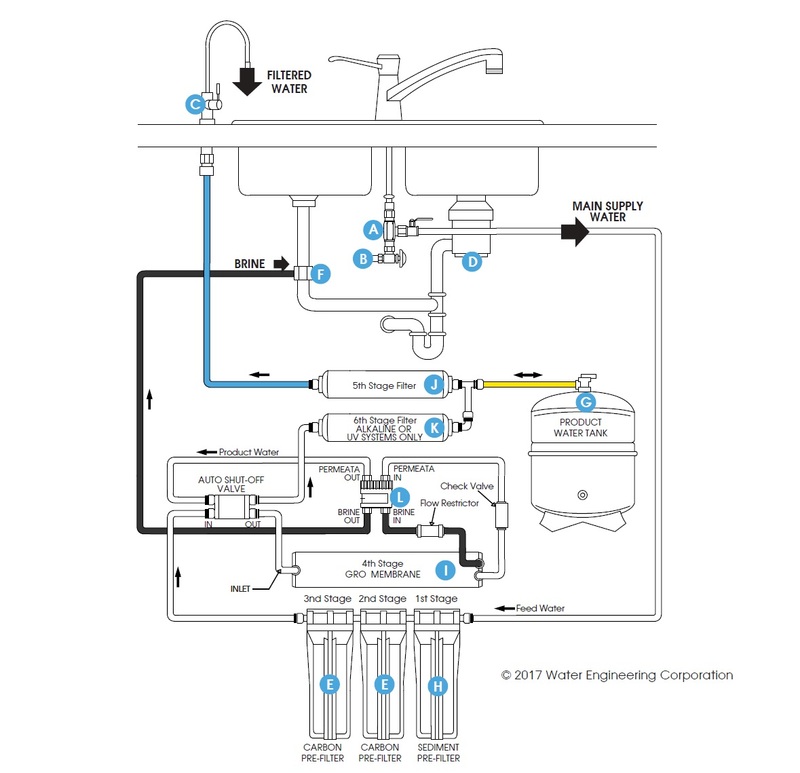 Install the pump directly in the RO feed line (see diagrams below) following these guidelines. 1. A sediment filter should always protect the pump large particulate matter in water. If the design permits, install the pump between the sediment filter and carbon filter since carbon filters before the pump may become too restrictive of the water flow and starve the pump. 2. Pumps must be mounted following suppliers recommendation. Mounting orientations such as pump vertical with head down may encourage air-locking, leading to pressure loss. 3. Mount the high pressure switch (tank switch) as closest to the tank as possible to avoid cycling of pump by reacting to the pressure drop in the tubing when the drinking water faucet is opened. 4. Flow of water through the pump is indicated by an arrow. Be sure you insert the tubing correctly. 5. If the boosted pressure is too high (typically >100 PSI), the RO fittings and housings can develop leaks. There is a top adjustmet screw on the pump head that can be used to lower the pressure. An electric booster pump kit such as FC-1400 can very efficienty boost the line pressure up to 80 PSI. This simple low-cost setup is the most commonly used design in residential reverse osmosis industry. A differential pressure controlled automatic shut off device (ASO valve) and a high-pressure switch controlls the pump and water flow into the membrane. When the tank pressure gets up to 60% of the incoming pressure the valve internally closes off the inlet. This will build up pressure on the high-pressure switch. FC-1400 kit includes a ¼" quick connect ASO valve, pump, transformer and a high-pressure switch for RO systems upto 50 GPD. FC-3800 kit includes a ⅜" " quick connect ASO valve, pump, transformer and a high-pressure switch for RO systems upto 100 GPD. 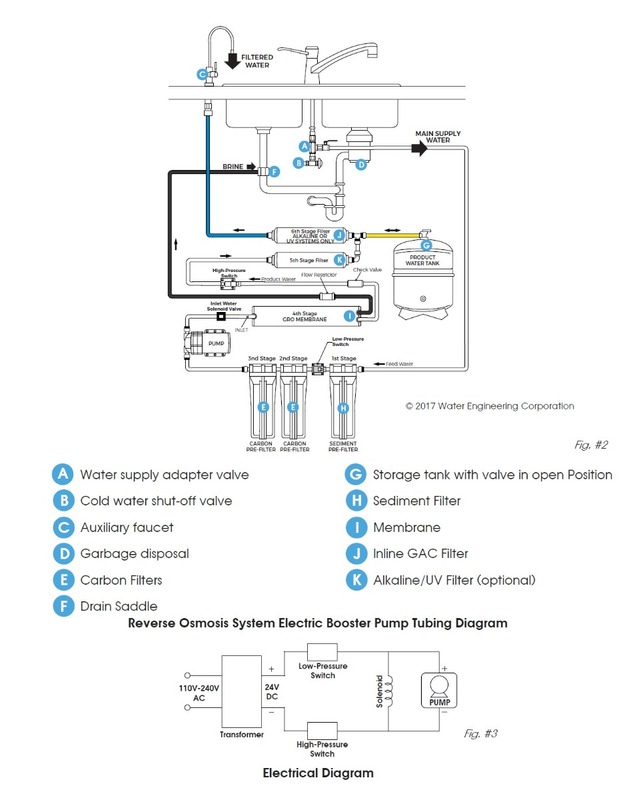 Most commercial reverse osmosis systems and high-end residential ro systems use the following design. Booster pump here is controlled by two pressure switches. A low-pressure switch at the inlet (activated or conducting current around 5 PSI) makes sure the pump will not run dry. A high-pressure switch (deactivated at 40, 60 or 80 PSI) cuts off power to the pump when the pressurized water storage tank has reached the capacity. A solenoid valve stops water supply to the membrane when the pump is off, preventing water running down the drain continuously. Wiring and plumbing diagrams below. ELCON-24 kit includes the solenoid, pump, transformer and high/low pressure switches.